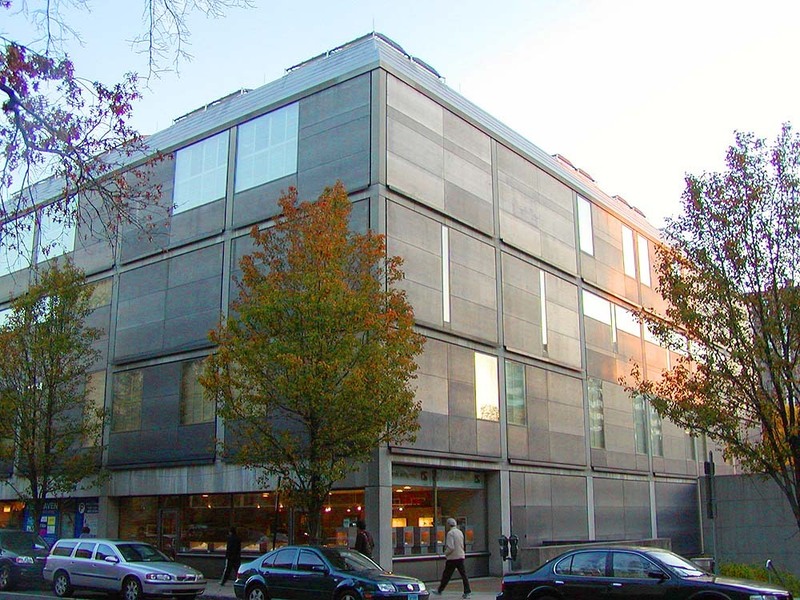 The Yale Centre for British Art (exterior) by Louis Kahn. Click on image for source. On my boss’ recommendation, I watched a PBS documentary on Costas Kondylis, a man I had never heard of prior to yesterday. He has made quite a mark on the Manhattan skyline, and while his aesthetic is subjective, one thing that seems clear is that he is a man of the people. And by people, I mean developers. 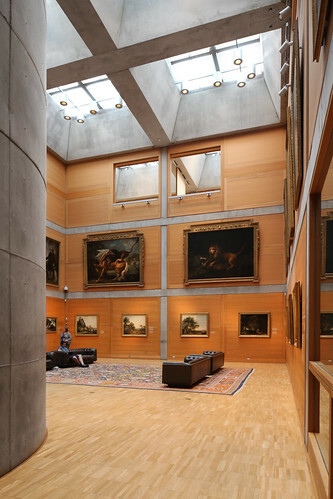 The Yale Centre for British Art (interior). Click on image for source. The film left me with mixed feelings. On the one hand, I saw a humble, hard working man who, despite the frustration of being sidelined by a colleague in his early years, was able to produce work that was appreciated by a real estate magnate who would later become one of his loyal patrons. On the other, I saw a man who embodied the principles that I was, as a student in architecture school, conditioned to repudiate. Costas Kondylis. Click on image for source. It is interesting that the film has fleeting scenes from The Fountainhead. When Ayn Rand’s book was making the rounds in 2nd year, I refused to read it. Based on what little research I had done on her philosophy, I decided that the book was not for me. I happen to believe that the good of the collective outweighs personal aspirations and that her beliefs, however well meaning she might have been, can be subversive. In the documentary, Rand’s Howard Roarke is pitted against Kondylis, the seemingly perpetual yes-man whose only dissension in the film has to do with the colour gold. I was taught, as a student, to fight for my ideas. To stand up to hypothetical engineers and developers and say enough is enough. To some extent, I agree with what my professors told me back then. However, this PBS documentary brings to light (and reminds me of days gone by, when putting pen to sketch paper was an experience I enjoyed) the fact that architecture is not about the architect. We zoom past the Kondylis-designed buildings along the West Side Highway and rant and rave about the travesty that is the modern day skyscraper, and forget that thousands, if not millions of New Yorkers, are quite content to call his buildings home. Content to come home to an apartment that has leak-free ceilings and enviable views (at a high premium, no doubt). If you have ever enjoyed a well-brewed cup of coffee on a cold morning, then you know what the phrase ‘simple pleasures’ means. For many, shelter is one of those simple pleasures, so who are we to insist on curved glass and odd shaped rooms just to inflate our own egos? I may not agree with the approaches that developers sometimes use. And there might be times when I do need to put my foot down in support of ideas that have been proven to work. However, I needed a personal reminder that the end user is the one who matters. Hubris needs to take a backseat. True joy is found in serving, not imposing. 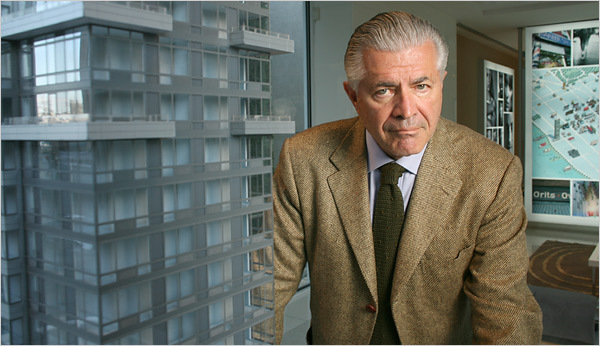 To many who enjoy his buildings, Kondylis’ name may never be known. His spaces will serve as a backdrop for memories, a setting for everyday life unfolded, and he may well be forgotten. And in my view, that is as it should be. Here’s to the architecture of anonymity. Nice. This applies in other forms of workmanship too. As a web designer, I may have all these cool ideas up in my head but what the customer wants is priority. It’s hard sometimes to let one’s ego take a backseat. But that’s what true service is all about. The customer is always right. We should find joy in their happiness.